I've been researching Bonnie Rowe for the past year, and have been lucky enough to become close friends with his son, Bonnie Rowe, Jr. I have many, many original documents, recorded family stories, etc. from Mr. Rowe, with the plans of someday writing a book about Bonnie Rowe. I've already published a few short accounts about him in an aviation newsletter, and in the Gwinnet Co. historical society paper. If you get the GBA channel on TV, (Georgia Public Broadcasting), you may have had a chance to see Mr. Rowe, Jr. on a documentary last night titled "The South Takes Flight." There was a huge section about Bonnie, Sr.--it was thrilling to see! Bonnie's part of the documentary was filmed out in Peachtree City, where Ron Alexander and several others are creating a reproduction of Candler Field--Bonnie, Sr's old stomping grounds (or jumping grounds, I should say! ).There is going to be a museum on site, and a section of it will be dedicated to Bonnie. According to his son, motorcycles were the one thing Bonnie was afraid of. Nope, he was just a daredevil, who, from childhood on, wasn't afraid of most anything. He was well known in Buford as a kid for standing on his head on top of the town water tower! As an adult he'd supplement his parachuting, wing walking income by standing on his head on water towers in small towns across the South. (That's how he met Bonnie Jr's mother, BTW--she nursed him after he fell from a tower in Gastonia, NC.) BTW, the mistake about the Bonnie being a motorcycle daredevil is a common one. His son tells me it was probably Bonnie's younger brother who wreaked such havoc in Buford,. Apparently the Rowe boys were all a little wild! One last clarification--Bonnie was actually hanging on the crossbeam (there's a technical term for it, but I don't know what it is), practicing for an upcoming exhibition. Apparently he just couldn't pull himself back up (his son thinks it was because of the many, many broken bones he'd sustained over the years), and finally just had to let go. Courtesy of Bill McElhannon, 1-12-07 "Bonnie Rowe was born June 18, 1900, at Buford, Georgia. Bonnie had no mechanical or pilot training. However, in 1922, when he learned of a parachute jumper opening in Tennessee, he applied for the job and was accepted. He and his family barnstormed the country as a parachute jumper--and daredevil. Barnstorming seemed to circulate in his veins. He became a leading daredevil--parachute jumping, wing walking and acrobatics while stunting. He was a star performer with the Mabel Cody Flying Circus for several years. He performed with Doug Davis' Flying Circus in the mid 20's. He jumped in practically every state in the Union, particularly the Southeast, performing in any town that afforded a landing field. In 1929, Bonnie won first prize at the Cleveland Air Races, for the delayed-opening parachute jump, against 31 of the world's greatest daredevils. 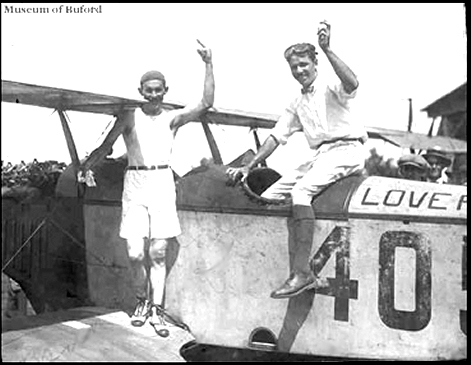 He held the world's record of more than 12,000 jumps.."
Editor's Note:You can read the rest of his story in the book, History of Hapeville. You may be able to find a few copies for sale by searching the net. There may also be a copy available through your library. 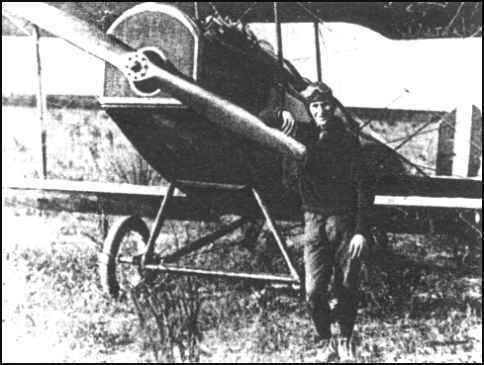 The article offers several other photographs of him and stories of other notable pioneer aviators. via email from Keith Humphrey I have very little info, but my father's first cousin was Bonnie Rowe who was a wingwalker with Mable's Cody's flying Circus. 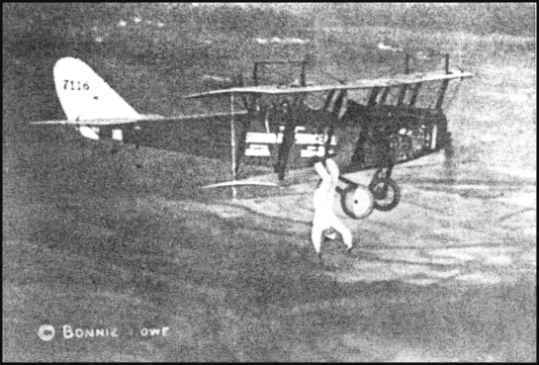 Bonnie was also associated with Doug Davis Sr. (learned to fly from the Wrights) Richard Curly Burns and Slim Culpepper. 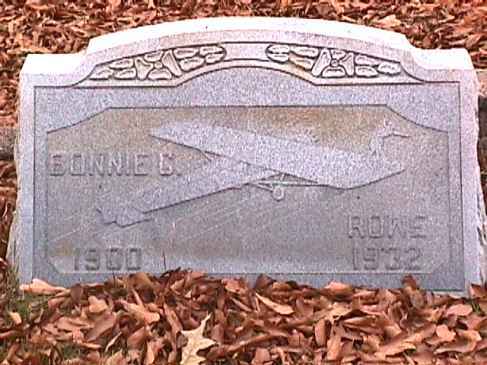 Bonnie Rowe was buried in his home town of Buford, GA. On his headstone is a man on the wing of a plane. Wish I knew more. I also did a little research on Bonnie Rowe during Thanksgiving. My uncle, who is in his 80's, remembers his cousin. My uncle says he was a daredevil before he started wing walking. He was a legend around Buford for a while, but most of those who could remember him are dead or in their upper 80s.
. A RESOLUTION 1 Commending Doug Davis, Sr.; and for other purposes. ONLINE RESOURCES If you search for "Bonnie Rowe. ", using the Google search engine, (11-21-06), you will find several links which offers copies of this resolution. .